Initially founded in 1975 by Peet Coombes, Annie Lennox and David Stewart as 'The Catch' - releasing one single "Borderline / Black Blood" on Logo Records (GO 103). Renamed to The Tourists after Eddie Chin and Jim Toomey joined in 1977. After moderate success The Tourists disbanded in 1980 and Stewart and Lennox started Eurythmics. With internet expanding its possibilities of hearing almost anything, I finally managed to get a listening grip on The Catch's one and only single release called 'Borderline' coupled with 'Black Blood'. Cannot say whether I'd be intrigued at the time of this release (probably wouldn't notice) but from a time distance, it is impressive to hear, already at this raw disco-informed stage how the core trio of Annie Lennox, Dave Stewart and Peet Coombes, lit a spark that marked them for their entire careers. Of the two, 'Borderline' is a much better offering, more consistent by its arrangement and presents how confident and amazing Annie sounds at this early stage of (t)he(i)r pop-career. 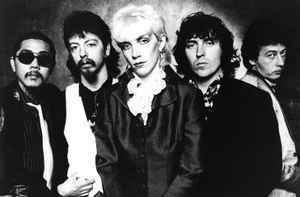 The second track is a bit clumsier but altogether, 'Black Blood' managed to hold its strings together, additionally featuring interesting trumpet touches towards the end of the song, which even echoes some of Eurythmics-to-come early ideas. In total, this attempt is impressive, but there is a feeling of the trio being forced into a specific marketing mould - being disco. Sounding more like tapping behind a certain Randy Crawford's disco signature (and both these songs do betray some obvious debts to the lady from her excellent 'Miss Randy Crawford' era), The Catch were effectively swimming, but couldn't last like this - luckily they were saved by ongoing Punk/New Wave explosion. While many in the press at that period expressed rather hostile opinions about The Tourists (as they re-christened themselves), Annie, Peet and Dave weren't bandwagon jumpers nor one-hit wonders. They simply looked for the ideal place to fit in (or out), with a vision - and positively stubborn attitude to succeed. Well, for Peet, as Wikipedia now explains, the future sadly wasn't that bright - but for Annie and Dave... well, that's a more well documented history now. With this single kickstarting it all. Recommended for occasional listening.